Nintendo Switch, which released in 2017, brought me back to 1997. It was a whimsical song from Mario + Rabbids: Kingdom Battle that did it. In the past year, I poured hundreds of hours into Nintendo’s latest and greatest of their well-loved franchises. Breath of the Wild, Super Mario Odyssey, Mario Kart 8 Deluxe all ate some of my precious gaming time. Other indulgences included indie games and ports of indie games I missed, with their frustratingly good gameplay such as Crypt of the Necrodancer and Enter the Gungeon with their killer soundtracks. It’s been a diverse year of gaming on this mishmash of a console and handheld hybrid. But none as surprising as the mishmash of the game that launched in the summer of last year. 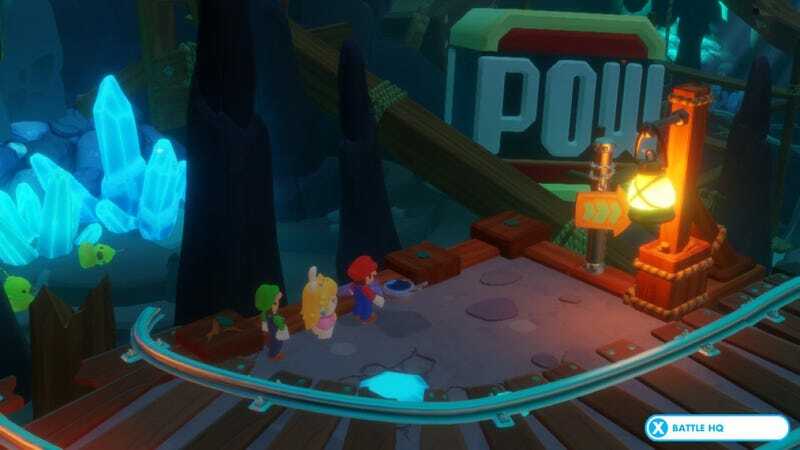 Mario + Rabbids, the strategy RPG which many lauded as the bizarre pairing of heroes that should not have worked but did, is the perfectly weird game Nintendo took a chance on with Ubisoft. Having never played a Rabbids game before, I knew nothing of them as characters. The Despicable Me minions equivalents of the gaming world? I only had a vague understanding of what awaited. And then there was “Mario with guns”. An idea that is far removed from the family friendly image Nintendo has curated over the years. So, of course it made sense that these Nintendo approved video game guns shot laser beams with the effects of sticky honey or chances at bouncing characters all over the map. What did I expect? Nothing, really. This game wasn’t even on my radar until the positive reviews started rolling in. Even then I was hesitant to buy it. Ultimately, I’m a sucker for Strategy RPGs—even though I consider myself relatively terrible at them. It took me over a decade to will myself to play Final Fantasy Tactics after trying and failing to do so the first time. I’ve been playing another for almost three years now because I get so caught up in fighting every single battle. This in turn reminds me of my backlog and gives me lots of stress. (Hello, Final Fantasy Tactics Advance). But that’s not what I found when I played Mario + Rabbids. I found that I didn’t stumble too much even when presented with a challenge in some of the stages. I found the boss battles intriguing. I found that I consumed the game in the span of a week or two earlier this year in January. I never wanted it to end. Since then, I haven’t quite found a game to satisfy the gaming craving I’ve had. Mario + Rabbids felt streamlined. Mechanics were introduced seamlessly to increase difficulty and combinations of play, whether through new moves, new weapons, or character playstyles. Charming details in the descriptions of the weapons, as well as the love letters crafted in the worlds of Mario + Rabbids are endearing tributes to the greater Mario universe. Some of the designs were surprising, such as the risque breastplate weapons of the valkyrie rabbids. Best of all, the game was straight-up fun. There was nothing more satisfying than watching Luigi snipe rabbids as he tossed them high into the sky. I felt that I was good at that game in spite of the times I didn’t execute a perfect run. I felt accomplished when after restarting a level in order to succeed a round without losing a team member. The 16 second mark had me wracking my brain as to its familiarity when I first heard it. That’s when its fairytale-like quality floated in that was so serene,and so mysterious. In the game, the mine houses crystals that glow with gentle hues of blue. It reminded me of all mysteries wrapped up in discovering the Lifestream and mako of Final Fantasy VII. I was brought back to my childhood of wandering around Mt. Nibel as Cloud, filtering his world’s lore to my hungry brain as I desired to learn more. The similarities chime in at the 34 second mark. This piece is more forlorn in context of the composition and the game itself but I couldn’t help but reminisce about my time spent with Final Fantasy VII when I played Mario + Rabbids. The strong sense of nostalgia is there even if the details of when it was played or exact story moments are muddied and bleeding into one giant ball in my mind. I felt sad and in awe that so much emotion could be triggered by music when I wasn’t expecting it, more so for connecting two games from wholly different genres with two vastly different stories. Both, however, reminding me of the pure joys that games could and have brought me. Creative works that stood on opposite ends of the spectrum of my personal video game history. Final Fantasy VII for being a quiet discovery of how brilliant games could be as I became reintroduced to the medium all those years ago. And Mario + Rabbids for being that unexpected but welcome joy that could still make me enamoured with video games so many years later. This was just one standout moment I had with the Switch. A small but significant one in my video game experiences that tied a memory from 1997 to one in 2018. It’s been a great year with the console, alongside the ones I’ve had on other systems with each bearing their own special meanings as games continue to delight, change, surprise and impress. I’m looking forward to many more experiences in the future.